If you vote a straight party ticket in the Republican primary, you won’t need a road map to vote the ballot. That’s because everyone on it will be a Republican. But if voters want to choose all Democrats, they will have to do some digging on their ballots to find them. A state Supreme Court decision has allowed independents to run in the Democratic primary, if they wish. For instance, there will be two Democrats in the U.S. House race and two independents, with only one winner among them advancing to the general election. However, to make it a little more confusing, Libertarians will also be on the Democratic ballot, but they are not competing against the Democrats or independents. But you wouldn’t know from the ballot. For instance, the Democratic ballot for governor, it lists Mark Begich with a D and William Toien with an L. However, the instructions tell people to “vote for one,” indicating they are running against each other. If a Libertarian is running unopposed, that person advances to the general election. But if there are two Libertarians in any given race, the top vote getter of those two advance. And if you aren’t confused enough, think about this. Independents have the option of running in the Democratic primary but they don’t have to. They could choose to skip the primary and go straight to the general ballot by gathering signatures. That’s what incumbent Gov. Bill Walker decided to do when it appeared that Begich, a former U.S. senator and Anchorage mayor, would run in the Democratic primary for governor. Walker, an independent, Begich and Toien, will advance to the November election against the winner of the Republican primary – likely former state Sen. Mike Dunleavy or former Lt. Gov. Mead Treadwell. The state Division of Elections has in the past set up Election Central at the Dena’ina Convention Center in downtown Anchorage. Television stations would set up mini studios inside the convention hall for live coverage, and candidates would parade from station set to station set for interviews. That won’t be the case during this year’s primary, with the state releasing results from Juneau. That will leave reporters in Anchorage scrambling Tuesday night to find candidates at various watch parties, usually held at downtown bars. 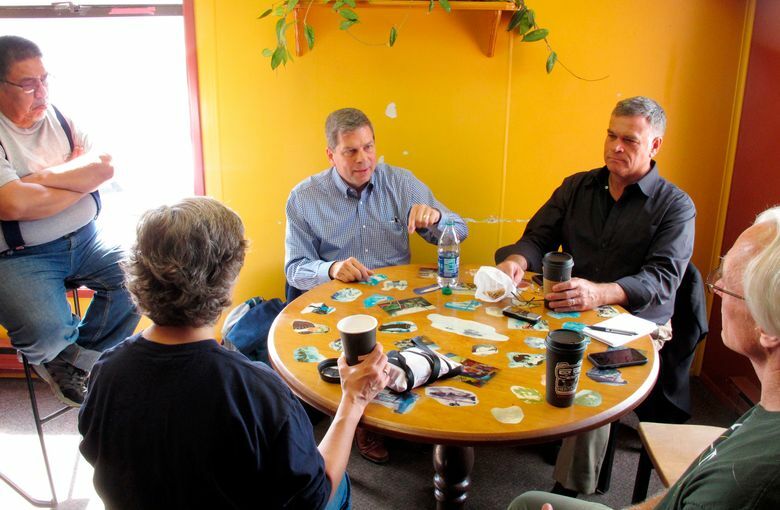 Democratic U.S. House candidate Dimitri Shein could have a first, hosting what he hopes is a victory party at Mad Myrna’s, the downtown Anchorage bar that caters to a gay clientele. It wouldn’t be the first time Mad Myrna’s was the backdrop for an historic event. On Oct. 12, 2014, the U.S. District Court struck down the state’s ban on gay marriage, and some of the five couples who were plaintiffs celebrated with drinks at the bar. 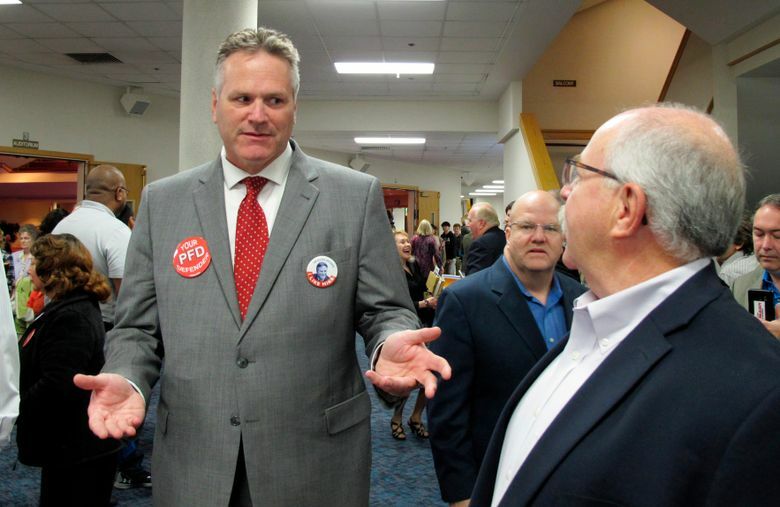 The state Republican party will host its watch party in a ballroom at the Aviator Hotel, where GOP gubernatorial candidate Mike Dunleavy will attend. 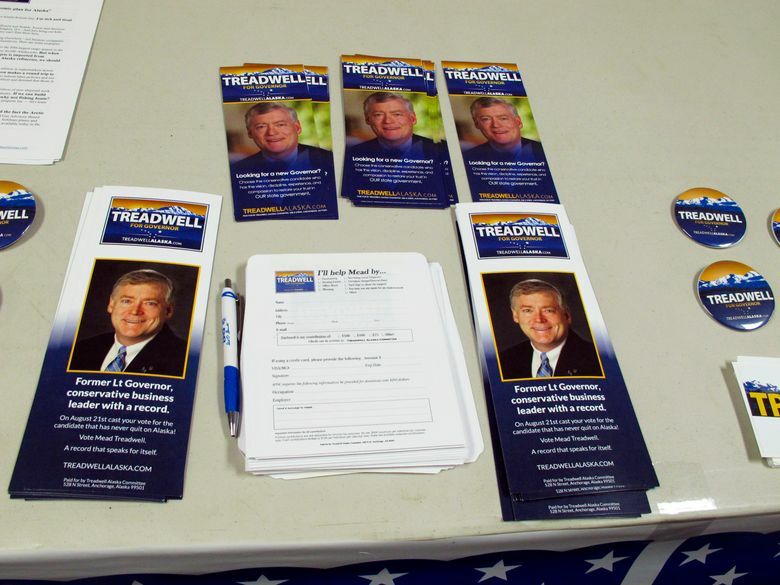 His main primary rival, Mead Treadwell, will be at Flattop Pizza. Few people know that independent U.S. House candidate Alyse Galvin is a trained opera singer. She attended college in California, where her first three years were concentrated in opera. Then she gave it up. “I decided that was a little bit self-serving,” Galvin said. She switched her major to political science in the mid-1980s and was active with things going on in South Africa and the waning days of apartheid. She was also part of the effort that brought anti-apartheid and human rights activist Bishop Desmond Tutu to California at the time. Though she gave up opera training, Galvin still sings. In fact, she played the lead role of Maria in “The Sound of Music” during a community theater performance in Anchorage. The general election race between U.S. Rep. Don Young, a Republican, and his likely opponent from the Democratic primary could be summed up by a generational divide in what they drive. Young, at age 85 and in office since 1973, drives around Washington, D.C., in an old Cadillac, his spokeswoman said. If independent Alyse Galvin or Democrat Dimitri Shein wins the Democratic primary, either’s vehicle will pit new technology against the conception of an old-style gas guzzler. Shein drives one of only 94 Tesla electric cars registered in Alaska. Galvin and her husband, Pat, both drive hybrid Priuses. Pat Galvin, the only Democratic cabinet member in former Republican Gov. Sarah Palin’s administration, is now an oil company executive.